← The GREAT British Afternoon Tea-Off Event! And for anyone that’s read the books you know that The Battle of the Five Armies is going to be an emotional ride. Jackson goes on to say that, as Tolkien intended, “There and back again” refers to Bilbo’s journey to the Lonely Mountain, (which is already covered in the second film, “Desolation of Smaug”), and his return to Hobbiton. He adds to not be surprised if the title is used for a future box-set release of all three films! Sir Peter has been hard at work not only completing “The Hobbit; The Battle of the Five Armies” but also editing the eagerly anticipated extended version of “Desolation of Smaug” with over 25 mins of new scenes, all scored with original music composed by Howard Shore. It’s going to be an amazing and emotional year for Peter Jackson and Tolkien fans alike as we see a nearly two decade filmmaking journey come to an end with The Hobbit: The Battle of the Five Armies. No matter what the title of this final film is called…I’ve got my Hobbit feet on and ready to run to the nearest box-office for my ticket…I can’t wait! This entry was posted in Home Page Posts and tagged Martin Freeman, Peter Jackson, Richard Armitage, The Hobbit, Tolkien. Bookmark the permalink. 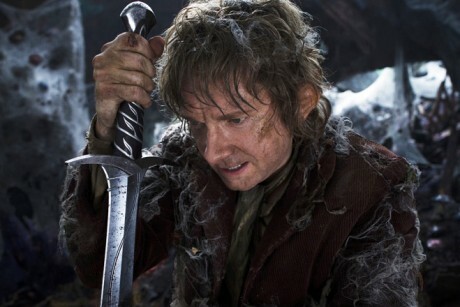 1 Response to Peter Jackson Renames Final Hobbit Movie! You’d think history teaches us anything, but that’s so rare. Hate all you want but the world changes, and none of us have no control whatsoever over it. For instance, imagine Obama had enough balls to put Putin to his place, but it seems like it’s not happening, welcome world war.